Dr. Maria Montessori believed that “only through freedom and environmental experience is it practically possible for human development to occur.” At Hudson Montessori School, we strive to create a unique and individualized educational experience for each child in our Primary Program, which brings the best of both Montessori and traditional teaching methods into the classroom. 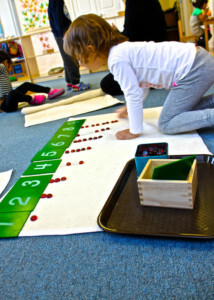 We “foster a love of learning” in each child and help them think critically and creatively about the world around them. The Primary Program at Hudson Montessori serves as the core unit of study in the Montessori Method and is the foundation for all future learning at our school. 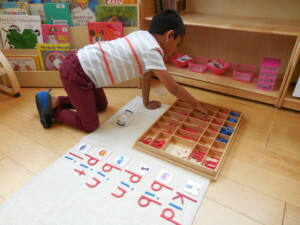 The Primary Program is a multi-age classroom setting, with students ranging in age from 3 to 5 years old. The classroom is a creative, innovative and constructive environment, which is designed to cater to the developmental needs of our students. We connect what our students are learning with real world events, allowing for integrated and constructive studies based in the reality of everyday life. In the classroom, we move from concrete to abstract concepts by relating and integrating all student learning through thematic approaches and carefully designed units of study. The themes explored are based around seasons and cultural events, such as the fall season and the thanksgiving celebration. Starting mid-winter, children begin an in-depth cultural and geographical study which unites world events, history and culture. 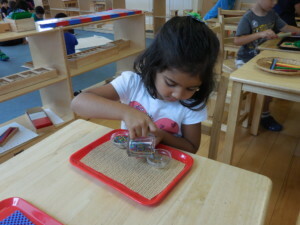 Recent cultural studies explored at Hudson Montessori include The Americas and The Silk Road. Our curriculum integrates all areas of learning into a holistic education system that fulfills the cognitive, creative, social and developmental needs of the students. All aspects of learning are intertwined, as we do thematic studies which revolve around cultural, seasonal, geographical and historical studies. Dr. Montessori stated, “Growth comes from activity, not from intellectual understanding.” Therefore, our classrooms are filled with stimulating Montessori and teacher created materials that are geared to stimulate each child’s curiosity and intellect. Toward the end of the school year, we hold two annual events to invoke Dr. Montessori’s belief that “the things [which a child] sees are not just remembered; they form a part of his soul.” These two events, the Social Studies Fair and the Year End Celebration, provide avenues for our students to synthesize all cumulative learning in an experiential, visual and tactile manner through exhibits, dance, drama and cultural displays. Please click on the Events tab to see the joy of learning manifest on the young faces of our children!